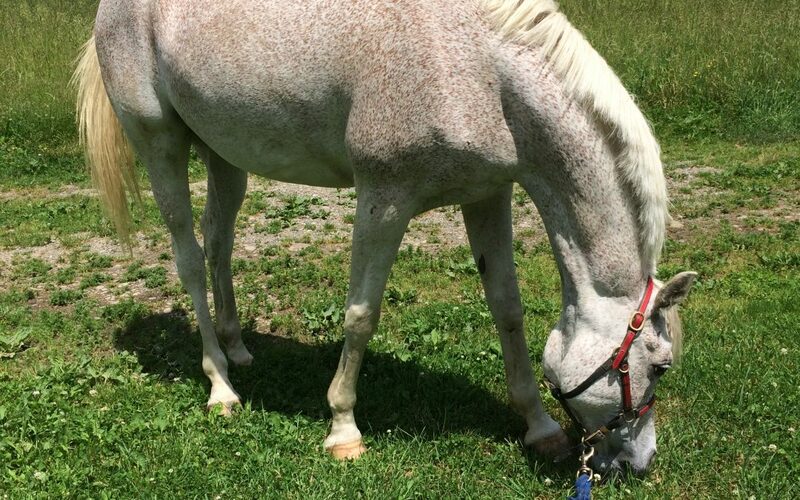 Three months ago, we bought Iggy, an 11 year old Arabian who had done a couple of 25 mile rides and a moderately paced 50 miler at age 6 or so. He’d been purchased, but life got in the way with his new owner, and he didn’t have a full time (or even part-time) job for the last few years. Iggy on the day we bought him. March, 2017. Me, on the other hand, well, I have two full-time jobs right now. I’m continuing to work steadily with my long-standing training and consulting business, while working feverishly on establishing and growing the new one, a web-based training business, just a year old. I don’t think my conundrum is the least bit unique. Most endurance riders with horses they are legging up struggle just like me, finding the time (and sometimes the energy) to train and condition. He’s got good bone structure, a solid education, and an unflappable nature. He loves to eat. (And yes, that is actually a very big deal.) He’s an excellent traveler and found camping at a ride to be a non-event. Iggy’s work ethic is dubious. He’s a little barn sour. I’ve worked on this in some traditional ways. I’ve insisted on him moving forward (whip and a few leg thumps), left him alone (militantly legs off, seat quiet) when he’s traveling along freely or offers to go forward after hesitating or balking. I’ve done the come back to the barn but then do a little ring work, or come back to the barn and head right out for the driveway for a little jaunt, so that coming home doesn’t always mean dismount, untack, get turned out. I was tickled to find that when we hauled out to a different environment that I had a much more forward and happy to go along horse. I’d prudently swapped him from the hackamore to the Myler combination bit and found that I actually had to hold him back a bit when other horses moved at a healthier clip. Fortunately, I also found that he was pretty tolerant about being encouraged to keep a steady pace. Phew. With a bunch of travel recently, he got a full week off work and we were right back to square one, balky and cranky leaving the barn. I encouraged him to move out, he sucked back, I touched him with the whip, he kicked out, I touched him again, he kicked out a little bigger then reluctantly moved out. 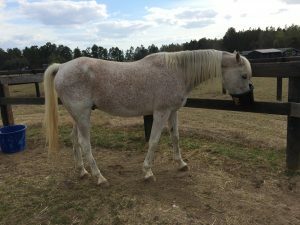 It got a bit better, but I recalled some advice my friend Donna (an endurance rider from “way back when” and one of my mentors) gave to another friend about her barn sour horse. She recommended tacking up, mounting and then just sitting there, outside the barn, waiting for the horse to offer to move. Lots of pats and praise. So we got to our little creek, a spot Iggy has opted to stop before, and sure enough, he hit the brakes and gave me a chance to experiment. I sat quietly when he stopped. He attempted to turn around, I firmly pointed him back toward the creek and released all aids again. As I sat there, I remembered my very first riding instructor, a Marlboro Man cowboy called Mike. He lamented to me more than once — I was seven — that it was a shame so few people smoked while they were riding. He told me that a lot of problems could be solved by simply sitting there, lighting a cigarette and smoking it while the horse figured it out. So I sat. At one point Iggy decided maybe he’d back up. I simply closed my legs. Said no. He stood there again. At some point he sighed. We stood there a little longer. And then his ears went forward and he walked out, right through the creek and up the hill. I told him he was a good boy, made a point of making sure I wasn’t nagging him in any way and did the same thing (nothing) any time on that ride that he thought about stopping again. But as I turn 50 in less than a month, I admit that I am more inclined to use my head rather than force to train a horse these days. Would rather find a way to outsmart him to get to an end destination than find a larger whip or the bravery to escalate an argument. Am I a wuss? Probably. I accept that. We went from little 3 or 4 miles around our hilly and muddy trails to adding some longe work in a Pessoa system to some longer rides, more hills, longer stretches of trotting and cantering during this three month window. We’re now doing 10+ mile conditioning rides, some slower and tougher, others faster, with long stretches of trotting and cantering. Iggy has been delightfully free of any soreness, leg fill, interference or tack rubs. He’s getting bigger and stronger and, I think, even more handsome. He no longer looks like a 90-pound weakling. He rather looks like an endurance horse. A couple of times I have used my stethoscope to check his heart rates after a ride. His recoveries seem good, but I must admit, I’m mostly just listening to how he feels, sounds, moves and how readily he seems to handle the trail ahead of him. Coming from a southeast home, he was a bit flummoxed by our mud, our hills, our rutted trails, our occasional rocks and frequent deadfall as an obstacle. That’s gotten better, although last weekend he slid down a hill a bit and kind of sat like a dog. That startled me a bit, but I was admittedly more startled when he scrambled back up, pitching me forward where I landed unceremoniously in front of him on the downhill slope. I hate falling off, but I am pleased to announce that I at least have a little bruising on my lower back right above my tramp stamp (as if!) so I have proof that I landed hard. Like a new car ding, phew, got that out of the way! Next weekend we head to Canada. I’m riding Iggy in the 30 mile set speed ride, sort of a cross between an AERC LD ride and a CTR, with typical AERC vetting but an optimum time window for completion. Rachel has agreed to ride Sarge along with us, hand brake firmly on, to set a steady pace and provide good company. 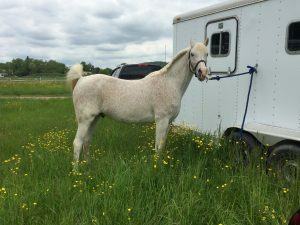 For us, it will be a training ride, an opportunity to ensure Iggy behaves well for vetting, eats and drinks as he does at home, and learn how he paces in a competition environment. I have my fingers crossed for the Moonlight in Vermont 50, where Terry, Iggy’s former owner, has offered to come and crew for us. The 30 next weekend is nicely timed, and if he comes through that with flying colors, we’ll be Vermont-bound.